T cells are lymphocytes (a class of white blood cells) that play a central role in the adaptive immune system, and specifically in the cell-mediated immune system. They can be distinguished from other lymphocyte types, such as B cells and NK cells, by the presence of a special receptor on their cell surface that is called the T cell receptor (TCR). The cell-mediated immune system is very complex and highly coordinated. It involves intricate pathways to produce and activate T cells, such that the T cells produced are specific in mobilizing against a particular threat to the body, including microorganisms and infected cells. Yet, these T cells do not attack healthy parts of the body itself, nor even intracellular, symbiotic bacteria that are helpful, such as E. coli. This reveals a stunning harmony in nature. The abbreviation "T," in T cell, stands for thymus since it is the principal organ for their development. They are also known as T lymphocytes. The adaptive immune system, also called the "acquired immune system and "specific immune system," is a mechanism to allow animals that survive an initial infection by a pathogen to generally be immune to further illness caused by that same pathogen. The adaptive immune system is based on dedicated immune cells termed leukocytes (white blood cells). The basis of specific immunity lies in the capacity of immune cells to distinguish between proteins produced by the body's own cells ("self" antigen), and proteins produced by invaders or cells under control of a virus ("non-self" antigen). This distinction is made via T-Cell Receptors (TCR) or B-Cell Receptors (BCR). For these receptors to be efficient they must be produced in thousands of configurations; this way they are able to distinguish between many different invader proteins. In many species, the adaptive immune system can be divided into two major sections, the humoral immune system and the cell-mediated immune system. The 'humoral immune system acts against bacteria and viruses by means of proteins, called immunoglobulins (also known as antibodies), which are produced by B cells. The cell-mediated immune system destroys virus-infected cells (among other duties) with T cells. That is, cell-mediated immunity is an immune response that does not involve antibodies, but rather involves the activation of macrophages and natural killer cells, the production of antigen-specific cytotoxic T lymphocytes, and the release of various cytokines in response to an antigen. Several different subsets of T cells have been described, each with a distinct function. Cytotoxic T cells (Tc cells) destroy virally infected cells and tumor cells, and are also implicated in transplant rejection. These cells are also known as CD8+ T cells, since they express the CD8 glycoprotein at their surface. 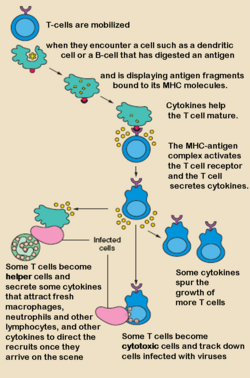 Helper T cells, (Th cells) are the "middlemen" of the adaptive immune system. Once activated, they divide rapidly and secrete small proteins called cytokines that regulate or "help" the immune response. These cells (also called CD4+ T cells) are a target of HIV infection; the virus infects the cell by using the CD4 protein to gain entry. The loss of Th cells as a result of HIV infection leads to the symptoms of AIDS. Memory T cells are a subset of antigen-specific T cells that persist long-term after an infection has resolved. They quickly expand to large numbers of effector T cells upon re-exposure to their cognate antigen, thus providing the immune system with "memory" against past infections. Memory T cells comprise two subtypes: central memory T cells (TCM cells) and effector memory T cells (TEM cells). Memory cells may be either CD4+ or CD8+. Regulatory T cells (Treg cells), formerly known as suppressor T cells, are crucial for the maintenance of immunological tolerance. Their major role is to shut down T cell mediated immunity towards the end of an immune reaction and to suppress auto-reactive T cells that escaped the process of negative selection in the thymus. Two major classes of regulatory T cells have been described, including the naturally occurring Treg cells and the adaptive Treg cells. Naturally occurring Treg cells (also known as CD4+CD25+FoxP3+ Treg cells) arise in the thymus, whereas the adaptive Treg cells (also known as Tr1 cells or Th3 cells) may originate during a normal immune response. Naturally occurring Treg cells can be distinguished from other T cells by the presence of an intracellular molecule called FoxP3. Mutations of the FOXP3 gene can prevent regulatory T cell development, causing the fatal autoimmune disease IPEX. Natural Killer T cells (NKT cells) are a special kind of lymphocyte that bridges the adaptive immune system with the innate immune system. Unlike conventional T cells that recognize peptide antigen presented by major histocompatibility complex (MHC) molecules, NKT cells recognize glycolipid antigen presented by a molecule called CD1d. Once activated, these cells can perform functions ascribed to both Th and Tc cells (i.e. cytokine production and release of cytolytic/cell killing molecules). γδ T cells represent a small subset of T cells that possess a distinct T cell receptor (TCR) on their surface. A majority of T cells have a TCR composed of two glycoprotein chains called α- and β- TCR chains. However, in γδ T cells, the TCR is made up of one γ-chain and one δ-chain. This group of T cells is much less common (5% of total T cells) than the αβ T cells, but are found at their highest abundance in the gut mucosa, within a population of lymphocytes known as intraepithelial lymphocytes (IELs). The antigenic molecules that activate γδ T cells are still widely unknown. However, γδ T cells are not MHC restricted and seem to be able to recognise whole proteins rather than requiring peptides to be presented by MHC molecules on antigen presenting cells. Some recognize MHC class IB molecules though. Human Vγ9/Vδ2 T cells, which constitute the major γδ T cell population in peripheral blood, are unique in that they specifically and rapidly respond to a small non-peptidic microbial metabolite, HMB-PP, an isopentenyl pyrophosphate precursor. All T cells originate from hematopoietic stem cells in the bone marrow. Hematopoietic progenitors derived from hematopoietic stem cells populate the thymus and expand by cell division to generate a large population of immature thymocytes (Schwarz and Bhandoola 2006). The earliest thymocytes express neither CD4 nor CD8, and are therefore classed as double-negative (CD4-CD8-) cells. As they progress through their development they become double-positive thymocytes (CD4+CD8+), and finally mature to single-positive (CD4+CD8- or CD4-CD8+) thymocytes that are then released from the thymus to peripheral tissues. About 98 percent of thymocytes die during the development processes in the thymus by failing either positive selection or negative selection, while the other 2 percent survive and leave the thymus to become mature immunocompetent T cells. Double-positive thymocytes move deep into the thymic cortex where they are presented with self-antigens (i.e. antigens that are derived from molecules belonging to the host of the T cell) complexed with major histocompatibility complex (MHC) molecules on the surface of cortical epithelial cells. Only those thymocytes that bind the MHC/antigen complex with adequate affinity will receive a vital "survival signal." The other thymocytes die by apoptosis (programmed cell death), and their remains are engulfed by macrophages. This process is called positive selection. Whether a thymocyte becomes a CD4+ Th cell or a CD8+ Tc cell is also determined during positive selection. Double-positive cells that are positively selected on MHC class II molecules will become CD4+ cells, and cells positively selected on MHC class I molecules will become CD8+ cells. Thymocytes that survive positive selection migrate towards the boundary of the thymic cortex and thymic medulla. While in the medulla, they are again presented with self-antigen in complex with MHC molecules on antigen-presenting cells (APCs) such as dendritic cells and macrophages. Thymocytes that interact too strongly with the antigen receive an apoptosis signal that causes their death; the vast majority of all thymocytes initially produced end up dying during thymic selection. A small minority of the surviving cells are selected to become regulatory T cells. The remaining cells will then exit the thymus as mature naive T cells. This process is called negative selection, an important mechanism of immunological tolerance that prevents the formation of self-reactive T cells capable of generating autoimmune disease in the host. Note that if the hematopoietic cells (also called hemopoietic cells) are destroyed, such as by irradiation, the animal will die within a few days because of the inabilty to make new blood cells (Towle 1989). However, if a transfusion is made from the bone marrow of a healthy, compatible donor, the animal can be saved, as among these cells there are likely some that can colonize the irradiated tissues of the host (Towle 1989). Although the specific mechanisms of activation vary slightly between different types of T cells, the "two-signal model" in CD4+ T cells ("helper T cells") holds true for most. Activation of CD4+ T cells occurs through the engagement of both the T cell receptor and CD28 on the T cell by the major histocompatibility complex peptide and B7 family members on the antigen-presenting cell (APC) respectively. Both are required for production of an effective immune response. In the absence of CD28 co-stimulation, T cell receptor signaling alone results in anergy (lack of reaction by the body's defence mechanisms to foreign substances). The signaling pathways downstream from both CD28 and the T cell receptor involve many proteins. The first signal is provided by binding of the T cell receptor to a short peptide presented by the major histocompatibility complex (MHC) on another cell. This ensures that only a T cell with a TCR specific to that peptide is activated. The partner cell is usually a professional APC, usually a dendritic cell in the case of naïve responses, although B cells and macrophages can be important APCs. 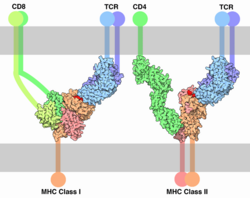 The peptides presented to CD8+ T cells by MHC class I molecules are 8-9 amino acids in length; the peptides presented to CD4+ cells by MHC class II molecules are longer, as the ends of the binding cleft of the MHC class II molecule are open. The second signal comes from co-stimulation, in which surface receptors on the APC are induced by a relatively small number of stimuli, usually products of pathogens, but sometimes breakdown products of cells, such as necrotic-bodies or heat-shock proteins. The only co-stimulatory receptor expressed constitutively by naïve T cells is CD28, so co-stimulation for these cells comes from the CD80 and CD86 proteins on the APC. Other receptors are expressed upon activation of the T cell, such as OX40 and ICOS, but these largely depend upon CD28 for their expression. The second signal licenses the T cell to respond to an antigen. Without it, the T cell becomes anergic and it becomes more difficult for it to activate in future. This mechanism prevents inappropriate responses to self, as self-peptides will not usually be presented with suitable co-stimulation. The T cell receptor exists as a complex of several proteins. The actual T cell receptor is composed of two separate peptide chains that are produced from the independent T cell receptor alpha and beta (TCRα and TCRβ) genes. The other proteins in the complex are the CD3 proteins; CD3εγ and CD3εδ heterodimers and most importantly a CD3ζ homodimer which has a total of six ITAM motifs. The ITAM motifs on the CD3ζ can be phosphorylated by Lck and in turn recruit ZAP-70. Lck and/or ZAP-70 can also phosphorylate the tyrosines on many other molecules, not least CD28, Trim, LAT, and SLP-76, which allows the aggregation of signalling complexes around these proteins. Phosphorylated LAT recruits SLP-76 to the membrane, where it can then bring in PLCγ, VAV1, Itk and potentially PI3K. Both PLCγ and PI3K act on PI(4,5)P2 on the inner leaflet of the membrane to create the active intermediaries di-acyl glycerol (DAG), inositol-1,4,5-trisphosphate (IP3), and phosphatidlyinositol-3,4,5-trisphosphate (PIP3). DAG binds and activates some PKCs, most importantly in T cells PKCθ, which is important for activating the transcription factors NF-κB and AP-1. IP3 is released from the membrane by PLCγ and diffuses rapidly to activate receptors on the ER which induce the release of calcium. The released calcium then activates calcineurin, and calcineurin activates NFAT, which then translocates to the nucleus. NFAT is a transcription factor which activates the transcription of a pleiotropic set of genes, most notably IL-2, a cytokine which promotes long term proliferation of activated T cells. Alberts, B., D. Bray, J. Lewis, M. Raff, K. Roberts, and J. D. Watson. 1989. Molecular Biology of the Cell 2nd edition. New York: Garland Publishing. ISBN 0824036956. Janeway, C., P. Travers, M. Walport, and M. Shlomchik. 2001. Immunobiology 5th edition. New York: Garland Science. ISBN 0815341016. Schwarz, B. A., and A. Bhandoola. 2006. Trafficking from the bone marrow to the thymus: A prerequisite for thymopoiesis. Immunol Rev 209: 47. Retrieved May 6, 2007. This page was last modified on 2 April 2008, at 17:21.